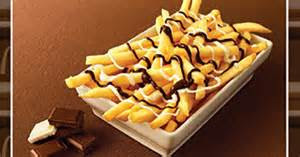 Did you read in the UK press this week that McDonald’s has released an unusual new dish in Japan - fries covered in chocolate? What do you think? 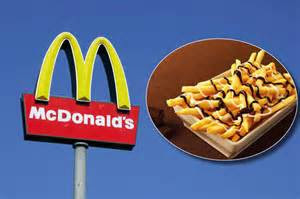 Are you excited or just plain bored with this company's attempt to get us back into their fast food restaurants? Suffering competition from new burger outlets such as Five Guys and The Handmade Burger Company, McDonald's are really 'scraping the barrel' with this one! Following criticism over the nutritional value of its food, McDonald’s has undergone a rebranding process in the last few years. 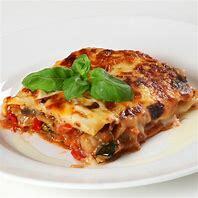 The fast food giant now markets itself as a relatively healthy option within the industry, selling products such as salads and vegetarian options. 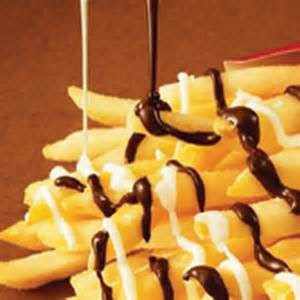 However, a normal large portion of fries - without chocolate sauce - contains 444 kcal and 22 grams of fat, while a Big Mac weighs in at 508 kcals and 25 grams of fat per portion. The Independent newspaper have contacted McDonald’s for comment on the nutritional content of McChoco Potatoes but have not had a response.